To my mind there is a difference between critique and criticism. Criticism is inherently negative, destructive; its purpose is to devalue. Critique can be negative, but must also be coupled with advice or suggestions to rebuild. Critique is made with an eye to improve and must be an essentially creative force. It is not always nurturing or gentle, but still essentially positive. I recently brought one of my pieces to the writer’s workshop for critique. It was the first piece that I wrote specifically for publication and was based on a premise that had been knocking around in my head for a quite awhile. It’s been on the “Hope and Rejection” tour for the past year and has gathered me quite the collection of rejections. Part of the reason, I knew, is that it is an odd little piece, not fitting any market’s target genre very neatly. I also suspected that the story itself had some issues and, being as how I have written quite a bit more over the past year and have learned a fair amount, thought it could do with a bit of clean-up before trying it again. So I polished it to a shiny glow, finding that I was still quite proud of it, and took it with me to read at the workshop for a final run-through before casting it out once again to gather fame and glory. To say it was met with less enthusiasm than I anticipated would be an understatement. Do you remember that scene in the movie A Christmas Story in which Ralph fantasizes about his theme (“What I Want For Christmas”)? He imagines his teacher waxing poetic over his use of language and punctuation and holds the piece close to her heart as she adds umpteen “+” marks to the A he has received. Then he receives the paper back with a C+ and the admonition that he’ll shoot his eye out. That was a bit of how I felt at the time. I received lots of feedback on the various issues with the piece (and there were a lot). I jotted them all down, the entire time feeling foolish and a bit slapped around. I didn’t have any comments for the other readings that night, as I spent most of the time going back over, in my mind, what was said about my piece. I was still wrapping my head around the mostly negative reaction to it. This was my third reading as a member of the workshop and my first two were met mostly with positive comments. This was a whole new experience for me. Now, don’t misunderstand me–no one was malicious or cruel or mean. Some were blunt. All were honest. And, most importantly all were right. Of course, I didn’t see this until later. After a day or so I reviewed my notes and found that most pointed out things that I really already knew or suspected. I had to remind myself that the work in question was one of my first and that the others I had read were written with more skill and more of a sense of what I was trying to accomplish. And, most importantly, this wasn’t an indictment of me but of the work–which is why I go to the workshop in the first place. I knew all of this when I decided to participate in the workshop. I didn’t go in with any illusions that I would be the belle of the writing ball, the toast of the workshop, and leave the professional, multi-published authors in the group in awe of my sheer talent. I went because I knew I had some talent and some skill and that I wanted to develop both. I knew that there was much I could learn from this process and that sometimes it would be hard. At least my brain knew this. My ego, on the other hand, holed up in his little glass house on the shore of a raging sea of doubt, was a bit overwhelmed by the onslaught. I also, in hindsight, feel bad because I let the critique affect my ability to contribute to the other readings that night. I feel that the process should be one of give and take and that, because of my preoccupation with the critique of my work, I took but failed to give. Another point I have to work on. So, I’m going to have to really re-work the story. I’ve taken it out of my publication rotation. Based on the feedback I got I may need to expand it, give it some space to make the reader care about what’s going on with the character and actually describe his world instead of hint at it. I need to turn it into an actual story instead of a short “ain’t-I-clever” piece. It’ll probably be on the back-burner for a while, but I’ll let it percolate as I work on other things. In the meantime, I’ll have to work on thickening the walls of my little glass house by the sea. 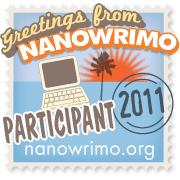 This entry was posted in Ramblings and tagged critique, editing, fiction, motivation, writing. Bookmark the permalink.